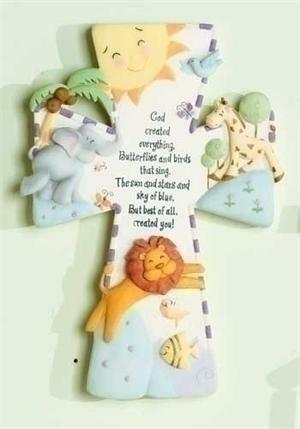 This delightful cross is decorated with enchanting colorful animals and a wonderful rhyme that points out the specialness of a child in the creation of God. A marvelous gift for a new baby or as a Baptism Gift. Measures 7" x 5" Hangs on Wall. Resin/Stone.